I have been looking to buy a soft foam play mat for the little man for ages as he loves playing outside with our next door neighbours little daughter with hers, and when we go to stay & plays, so I was delighted when I was contacted by Soft Floor Kids to try out one of their mats. 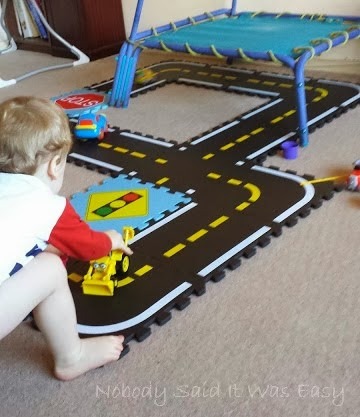 They have many mats to choose from on their website, including your standard colourful mats, alphabet mats, clock mats, even a play house, and the one we went for as little man loves playing with his cars, the road pattern play mat. 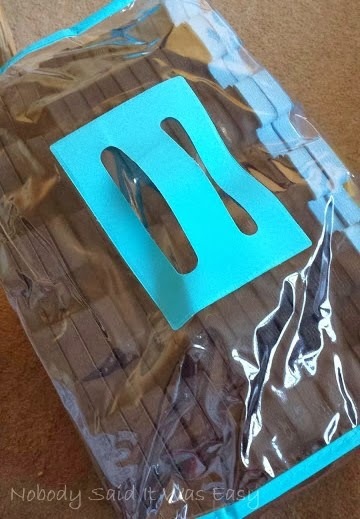 When the mat arrived it was packaged in a clear case with a handle, which is obviously good if you want to take it anywhere with you, for example on holiday or to Grandma’s. Now I’m not sure which man was more excited about its arrival, the big one or the little one! Little man loves playing with his vehicles – or “brum brums” as he calls them, and Daddy usually joins in too, which is why I chose this one as I knew they would get good use out of it. 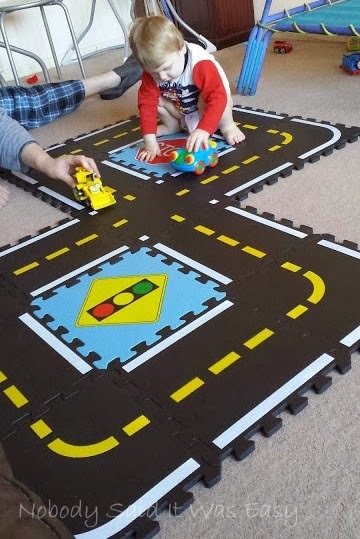 The road pattern play mat also comes with a stop sign and traffic lights, which I thought added more to the fun of playing with the cars on it. When I was unpacking it, little man couldn’t wait to get his hands on it, and as you can tell he was rather excited! We weren’t sure how to set it up at first, as there are 4 corners, the two sign pieces, and then the rest are road markings. So the men just went and did it any old how! The pieces are very easy to slot together, but sturdy enough that they stay together and don’t come apart easily. 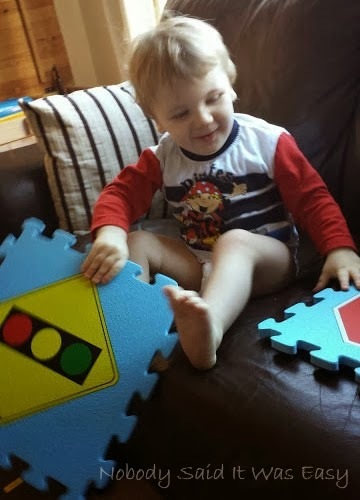 They are also very soft & bouncy so safe for if little man has a tumble – which he seems to have many of! Each mat is fairly large too, so when it is all pieced together it takes up a fair bit of room – maybe not so good if you only have a small room, but would be great outside. As soon as it was all pieced together little man dragged out all of his cars and got into action. I’m not sure how good a driver he would make at the minute though! Eventually I remembered that there was a photo of the most logical way to set it up, on the website – so of course I made hubby sort it out. 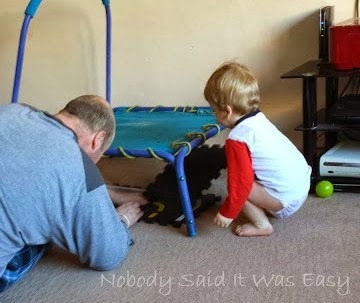 As you can see, both of the men took great pleasure in playing with it; in fact when it gets put away before bedtime little man has a little cry as he doesn’t want it to. Then he drags it out again in the morning. For the price it currently is on the website, I think it’s great for boys who like their cars and vehicles.